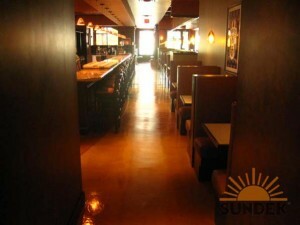 Concrete staining is one of the most aesthetically pleasing options for a concrete floor. Concrete stain employs acids that penetrate into the concrete and react with the hydrated lime contained in it. The result is a permanent color that will not fade with time and that will not chip or scrape off. The acid stain is permanent and it has some very attractive qualities to it. 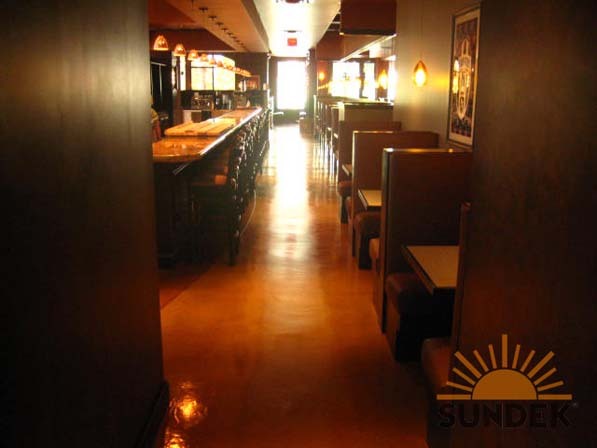 Stained concrete floors can have tremendous variation between one and the next. Stained concrete behaves a bit like stained wood. The stain itself doesn’t have any color. This makes it different from concrete paint. Concrete staining, where the eventual color is concerned, will depend greatly upon the concrete to which it is applied. Just as certain woods will give a particular pattern when treated with one particular stain, concrete will show patterns and color variations that give it a unique look. Stained cement floors don’t just turn color. They can be made to look like wood, rock or just about any other surface that you can imagine. At the same time that concrete itself provides tremendous variation when exposed to an acid stain, the staining materials available are always expanding. Today, you can get concrete stain applied that will provide more color options than the very established browns and grays that characterize most stained concrete. Stained cement floors can beautify any room. In a basement, garage, in an outdoor space or anywhere else, concrete staining can bring out the beauty of this surface, which is considerable, and can provide a unique look. If you have a home in the Bay Area or in Sacramento and you’re interested in concrete staining, be sure to contact Sierra Concrete Resurfacing for more information. We can provide you with excellent results with concrete staining or concrete paint.